Emergencies and disasters can happen at any time in the blink of an eye. Whether the emergency is man-made or natural, you need to be prepared, regardless of how serious the threat. If there is any time that a plumbing part is going to fail, it will be during an emergency situation. In times of emergency, there is no time to spare. It must be fixed immediately for safety reasons. The customer always comes first. If you feel as if your plumber does not put your needs at the top of his or her priorities, then we recommend that you address this issue to the company. If the issue is not resolved, then it would be best to find a new plumbing company. The best plumbing service comes with excellent customer service, especially in times of emergencies. 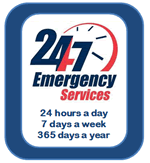 Emergency plumbing services should be backed by a 24/7/365 client support team. Everything in the house may be functioning properly; however, a plumbing emergency can occur at any moment. Usually, emergencies occur at the least expected times, such as 4:00AM or during the workday when there is nobody home. Whether it’s an issue with the sewer line, piping, or an overflowing toilet, your local plumber should be around to help. Plumbers should be trained to react appropriately in emergency plumbing scenarios in order to properly deliver effective emergency services. Plumbing emergencies tend happen at the least convenient time, such as during a graduation party or a holiday celebration. Luckily, the best local plumbing companies will offer emergency plumbing services 24/7/365. Emergency plumbing should always be available whenever a client is in need of services. With Rhode Island being a smaller state, it is easy for a local plumbing company to quickly travel to clients during the most inconvenient times. Emergency plumbing services require a quick, swift, and effective Rhode Island plumber to do the job. Choose a trustworthy and dependable company for this responsibility. It seems as though the weather has been getting more intense every year. Powerful hurricanes and storms appear to have become commonplace nowadays. Disasters are going to happen. Emergency plumbing services are designed for swift and thorough response to aid in the post-disaster recovery process. A local plumber from a reliable plumbing company will be able to achieve optimal response times for clients calling for emergency plumbing services. With 24/7/365 operations, a local plumbing company can also acquire new clients simply by making themselves available at times when other plumbers are not. The local plumber is able to respond to the scene of a local emergency plumbing emergency quickly. This helps to reduce the overall time that the plumbing system is not functioning properly and the stress of the client regarding the situation.